How to plan the perfect birthday party for your special needs child! I love that song! Little did I know that I would relive the words every year after I had my first child Billy. As most parents that have special needs children would know, birthdays can be…..well let’s just say challenging. There’s the dreaded birthday cake with the scary candles. The character themed plates, they are very scary things in my house. The guests and the noise! Billy’s first birthday was a grand event. I invited so many people, mostly my friends and family, It was a nice day. Billy wasn’t walking or talking but that didn’t matter as he was only one year old and had a rough year at that. He endured surgery, and loads of doctors appointments. I was happy we made it to one. After that birthday, things spiralled, emotionally, for me. Each year as March 10th drew closer, I felt myself feeling anxious, and just downright sad. Here I was holding on to a life that I had planned but no longer existed. I was joining in on conversations with friends about plans for our children’s birthdays. I actually planned them for the first couple of years. 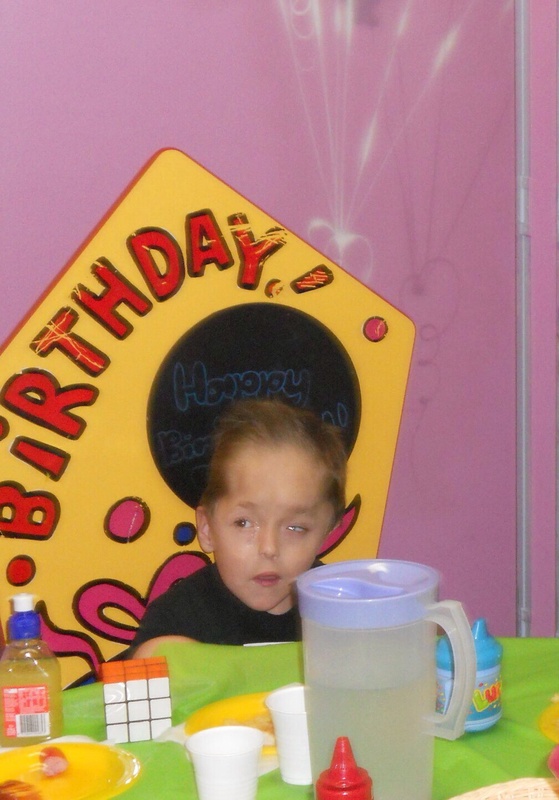 As we approached Billy’s fourth birthday, I started to feel different, I was angry! I realised that neither Billy nor I had really enjoyed one of those parties. The only people enjoying were the other children, while Billy and I sat inside away from the crowd and away from the birthday candles. That’s when I decided it was time to accept that my life was going to be different. Not only was I going to live a life caring for a special needs child, going to doctors appointments, hospital stays, therapy, etc, everything was going to be different. I spent some time feeling miserable, feeling sorry for myself and sorry for Billy for all the things we would miss out on. Then I realised I had a choice. I could cry and never enjoy Billy’s birthdays or I could change my idea of a what a great kids party was. To do this I had to think about what Billy liked, didn’t like and mostly what he could cope with. Some birthdays may be just a cake with family and friends, I don’t believe that we need to have a party every year. So I have shared some things I thought about when planning. Prepare your child. Create a visual calendar to prepare your child for the upcoming event. Also create pictures symbolising a party and attach them to the date of the party. This way your child understands what is happening and this will reduce the chance of a pre-party meltdown. Decide on where to have your do! The most important thing is that your child enjoys the day so if you have a child like Billy, having a bowling party just won’t work. Once you have decided on the venue, think about what makes your child tick along with what may cause a full blown meltdown. If you are having other special needs children at the party, talk to the parents and find out about their child. We want everyone to enjoy the day. Think about who to invite! This one needs some careful consideration. You don’t want to offend anyone. If you are inviting children from school that have special needs, you may want to refrain from inviting friends and family that have super energetic, loud kids. Most people will understand the situation or you could have a cake or little get together on another day for those people. This will depend on your guests and what you find out they can cope with. If your having it at a venue other than home, talk to the manager! I did this one year when I had a party for Billy at a playcentre. I wanted to let the manager know that Billy and some of his friends had special needs and what the venue could offer to make our stay as comfortable as possible. Its amazing how helpful people will be if you are open and honest with them. I told the manger that I would have some children with Autism at the party who may become anxious with noise and crowds, they gave me access to a time out room, which had a Dora video playing in case the children needed to calm. Try not to expect too much! If we think too much about what we want the party to be, rather than what our children are happy with, well we will just be disappointed. Go with whatever happens, and have a giggle about it all later. Give people ideas for presents. How many times has your child revived a present which you know he or she will never look at? It may sound rude but look at this way, if you don’t tell guests what to buy more than likely they will be wasting their cash. Remember to ask about any diet requirements. Many special needs children have dietary requirements such as mashed food or gluten free. To avoid any embarrassment and hunger pains, ask guests to inform you on the invitation. These are just some of the things you can do to prepare for this special celebration. As we all know, things may go wrong. Planning for things you can control, will ensure you feel comfortable and calm enough to enjoy your child’s birthday. Although the party may not be as fast paced or extravagant as you may have dreamed of, it will be everything your child needs and that is perfectly different. Do you have any other tips to share? If so please let us know by commenting!